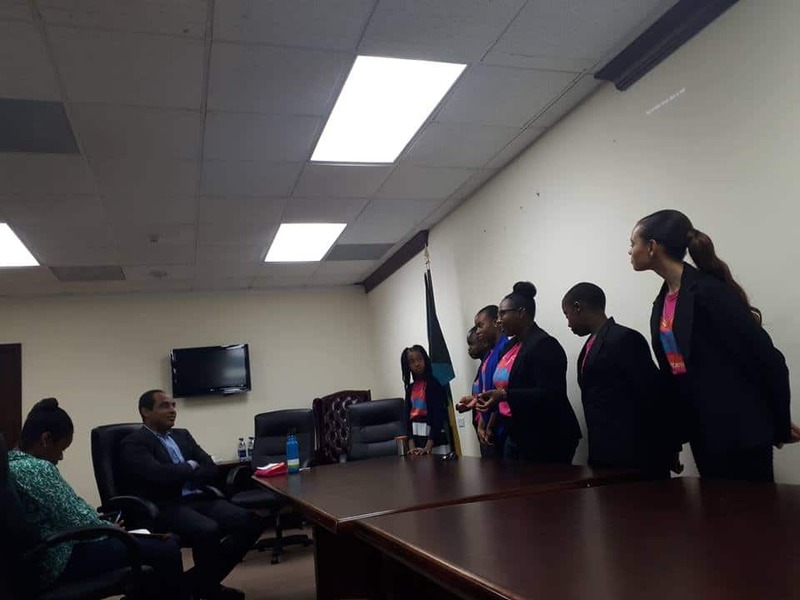 On January 3rd, 2018, the Bahamas Plastic Movement’s youth delegation from the island of Eleuthera, travelled to Nassau, New Providence to meet the Minister of Environment and Housing, The Hon. Romauld Ferreira, to propose the need for a nationwide ban on plastic bags for the country. 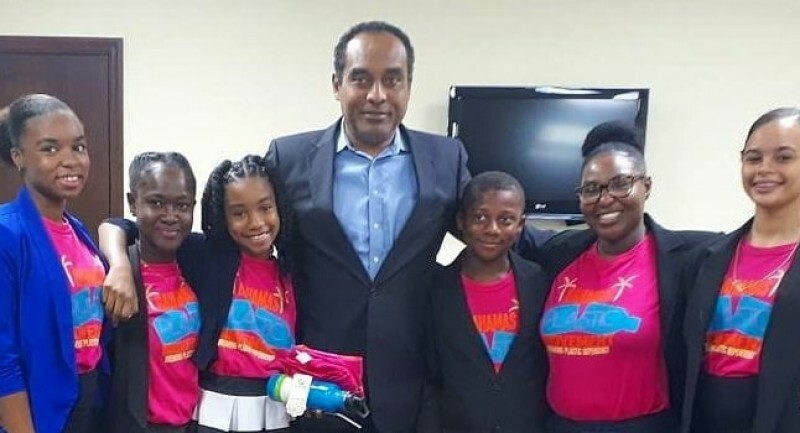 The self-proclaimed “Plastic Warriors”, members of the environmental NGO Bahamas Plastic Movement (BPM), visited the Ministry of Environment’s Charlotte House office in Nassau, where they presented a thorough presentation on the economic and environmental implications of plastic pollution in The Bahamas. Single use, disposable plastic items such as plastic bottles, straws, cups, styrofoam and plastic bags are known to be a nuisance in the environment. Plastic bags in particular are used in abundance within the country, globally up to 1 trillion plastic bags are used annually. Used on average for around 12 minutes, these extremely lightweight and aerodynamic plastic bags escape with the wind, evading trash cans and local landfills before eventually polluting our environment and finally making their way to the ocean before severely harming marine life such as whales, turtles and seabirds. “In our country, single use plastic items are commonly used and is very bad for the environment because it is a non-biodegradable material, so it just persists in our environment for an extended period of time, especially on our beaches where they may deter tourists”, states BPM’s Ocean Ambassador Genderia Francis. Approximately 70% of visitors to the Bahamas said that their decision to visit was influenced by its beaches. 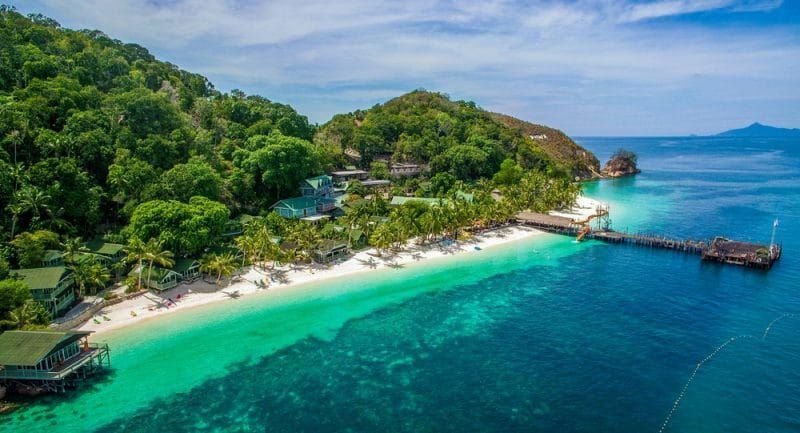 Recent scientific research suggests that if the rate of litter on a beach increases to 15 litter items per square meter, that would deter 85% of users, causing up to US$8.5 million in tourism losses annually. “Plastic bags are a major issue in this country as they are commonly used in businesses, so we wanted to confront this issue head on and propose a nationwide ban on plastic bags”, continued Francis. Leading up to their meeting with Minister Ferreira, the students participated in a Youth Activism Workshop hosted by BPM. Over the course of four days, students learned to conduct social science surveys to gather data on the amount of plastic bags used by locals on a daily basis. They also learned about the legislative process of The Bahamas. After reviewing several case studies of countries around the world with effective plastic bag bans in place, the students successfully drafted a legally binding bill for a plastic bag regulation for The Bahamas, which was then presented to the Minister. The first phase of the proposed regulation requested a levy on plastic bags for businesses and an imposed plastic bag tax for consumers wishing to receive a plastic bag at the point of sale. Combining their knowledge of plastic pollution with their research findings, proposed draft bill and effective communication skills, these plastic warriors successfully built an engaging and informative presentation that was a call to action for Minister Ferreira and a guide to leading The Bahamas “Towards a Plastic Free Future . Courageously, the “Plastic Warriors”, composed of, Charma Morley (15), Traliyah Carey (15), Glenderia Francis (16), Abigail Ramnarine (10) and Tarryn Johnson (14), marched into the Minister’s office and clearly outlined what action steps were required of the Ministry of Environment. 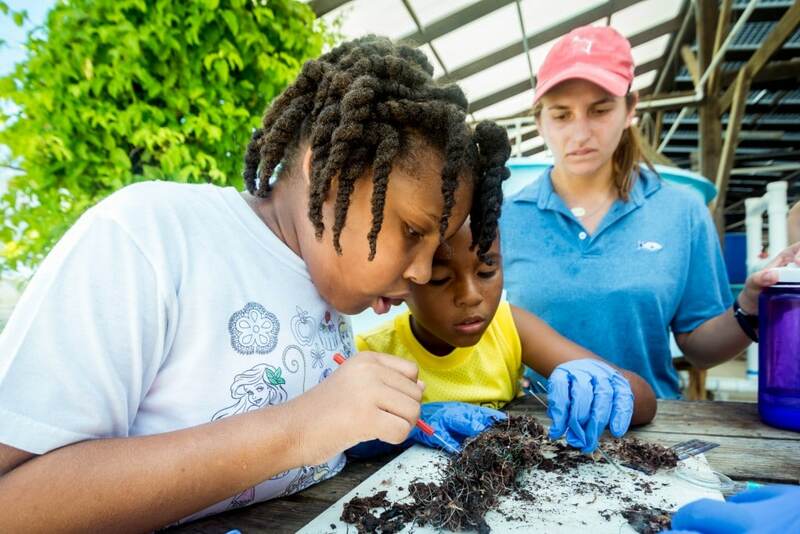 The team recommended 1) a partnership between the Ministry of Environment and Bahamas Plastic Movement to launch a national plastic pollution education campaign, 2) The Hon. Romauld Ferreira, Minister of the Environment and Housing agrees to push legislation for a plastic bag ban in The Bahamas by the end of the first quarter 2018 and 3) The Bahamas agrees to join the UNEP Clean Seas Initiative which is a global Call to Action for governments to introduce regulations and incentives to tackle marine debris. “Someone has to make the change for our generation and if we don’t do it, no one else will, so we have to be the voice of our community and make a change in society” says, Charma Morley, BPM Ocean Ambassador. Following the presentation, Minister Ferreira, expressed his gratitude, contentment and pride for the courage and commitment displayed by the “plastic warriors”. To the surprise of the group, he proposed to ban plastic bags completely in The Bahamas, followed by various types of single use plastics such as Styrofoam. The Minister revealed that the Ministry of Environment has been working diligently on formulating and pushing regulations with Parliament that address plastic use in the country and agrees that through laws and swift action, we will be able to mitigate plastic pollution in The Bahamas. At the 2018 Abaco Science Alliance Conference hosted by Friends of the Environment on January 4th, Minister Ferreira publicly announced his plans to move forward with a plastic bag ban for The Bahamas, joining a growing list of more than 40 countries who have already implemented plastic bag bans. To learn more about the organization and ways to decrease your plastic footprint, visit www.bahamasplasticmovement.org.